All of you know how to sorting column while clicking column header like mysql table in database through my previous post. Don't you know? Please visit this sorting column by clicking column header using php . 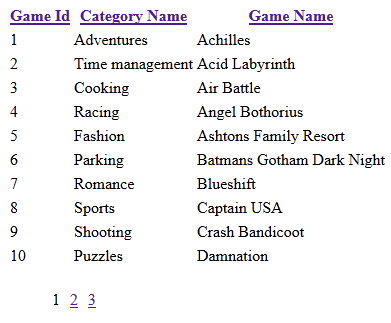 Now we are going to see about sorting column with pagination like table in mysql database. You sorting column by clicking column header in mysql table and you paginated to next page. You will get result followed by next value. ie, you sort column by id. First 30 values displayed in first page in mysql table. When you paginate to next page, you will get output from 31st to 60 in your mysql table. Can you make your table like mysql table with sorting and pagination? Yes, you can also done pagination using php. Already you know the sorting concepts. So now we will see sorting with pagination concepts. $limit is the number rows per page. $start is starting point of limit in mysql query. mysql_num_rows() returns the numbers results in numeric. ceil() returns the whole digit number. ie, ceil(2.3) => 3. $maxpage returns the number of pages. //values with similar sorted values. Where, you have to use small tricks. You have to pass the sorting and field values in url using function. ie, Already we set if the url get 'ASC' value, then it will take as 'DESC'. This is for sorting. Similarly, you have to do same thing for pagination. Now you can sorting column with pagination by clicking column header.